Recenly, I found a strange issue with my Customer’s VDP backup. There is VDP version 6.1.3 and vSphere 6.0 Update 2. The problem is that the backup jobs of a few virtual machines got stuck at 92%. The state was present for more than week at the first try, untill it was manually cancelled. 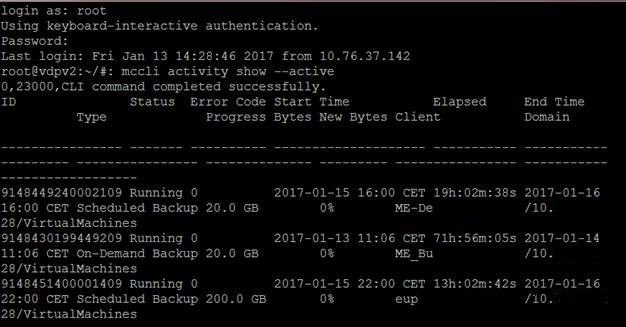 There is a way to check the actual status of backup via CLI. So did I.
I went through lots of communities and KBs, extended the memory as one suggested but it didn’t help. Then, I started to analyse logs more carefully ( of course I verified earlier that the snaps are consolidated, etc.) and realised that the progresss via CLI is going up to 20GB when it reaches about 45% at vSphere client task. But then it stops and nothing more happens even though the tasks progress go up to 92%. The courious thing is that the progress went up to 20GB which is the size of the one of disks in the VM. However, the VM has 2 disks, 20GB each, so there should be a value of 40 GB or 2 entries for each disk. That was a clue. Then I tried a test to backup a freshly installed VM with 2 disks, despite the seconds disks was empty at all, the backup job get stuck the same way. Next thing was to remove the disk from the VM and voila – the backup jub ended successfully. That’s mean that the workoardound is to backup only single disk Virtual Machine. But on the official documentation I did not find any restriction or constraint of VDP according to number of disks. Furthermore I made additional test in my test environment where older version of VDP is present (6.0.3) and there wasn’t any problem with backups of VMs with multiple disks. It worked completely fine there. I reckon it’s a kind of new bug in the 6.1.3 version, I’ll try to check it with VMware Support and let you know. If you had simmilar issue I’ll be glad to hear about it.